Organised since 1994 by the PDC it has always been held in probably the most attractive darts venue in the world, the Empress Ballroom in the Winter Gardens in Blackpool. Always warm or should we say hot, and always filled with enthusiastic crowds. When Phil Taylor retires in January 2018 the World Matchplay trophy is renamed “The Phil Taylor Trophy”. The most surprising winner of any major TV event in the last 25 years is the first winner. Larry Butler from the USA has his career highlight lifting the trophy in 1994. As is common in all PDC events, Taylor’s name appears on the trophy more than any other, no less than sixteen times his name is engraved in the trophy. He wins five times in row between 2000 and 2004 and seven times between 2008 and 2014. Rod Harrington, two years PDC No.1 has won the event twice in 1998 and 1999. Michael van Gerwen is the only other player to win the Matchplay twice, in 2015 and 2016. 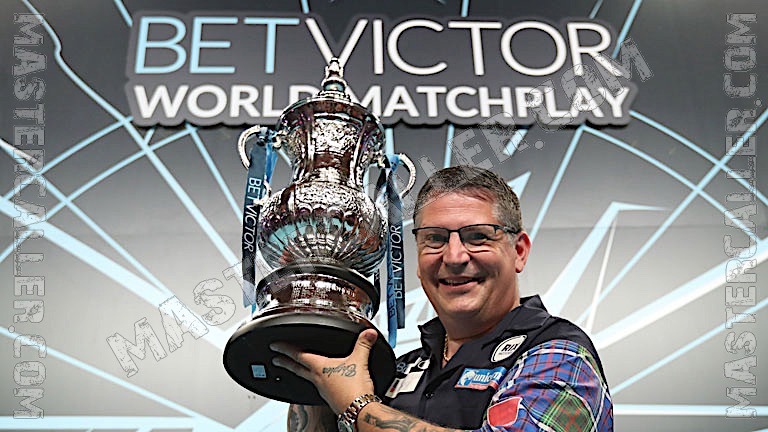 Gary Anderson lifts the trophy in 2018 for the first time. The World Matchplay was organised by the BDO in the 80’s as the MFI, but only shares its name as it is not the same event, therefore it has not been included in the stats.